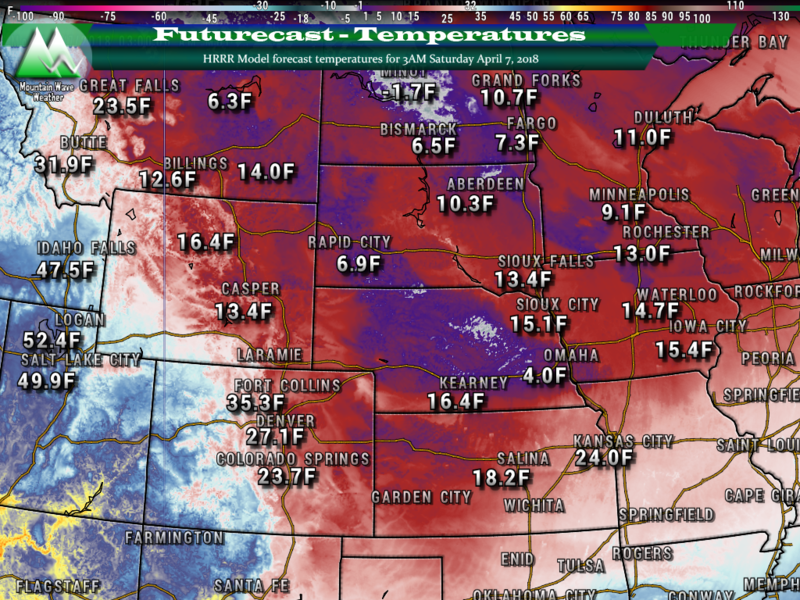 4/9/2018 – Bring on the Heat! The storm system moving today won’t be super impressive in terms of snowfall… the main impact will be the wind and the cold temperatures. Many of the local TV stations have been harping on this all week, but if you’re going to the Rockies game today… it’s going to be cold! 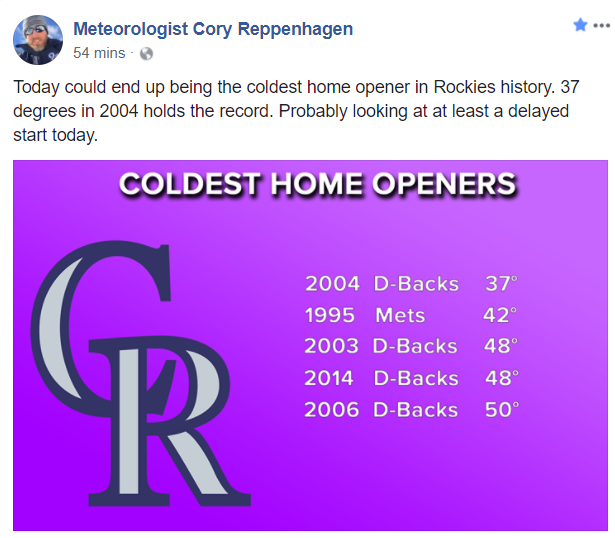 Today’s home opener for the Rockies could be one of the coldest in history. 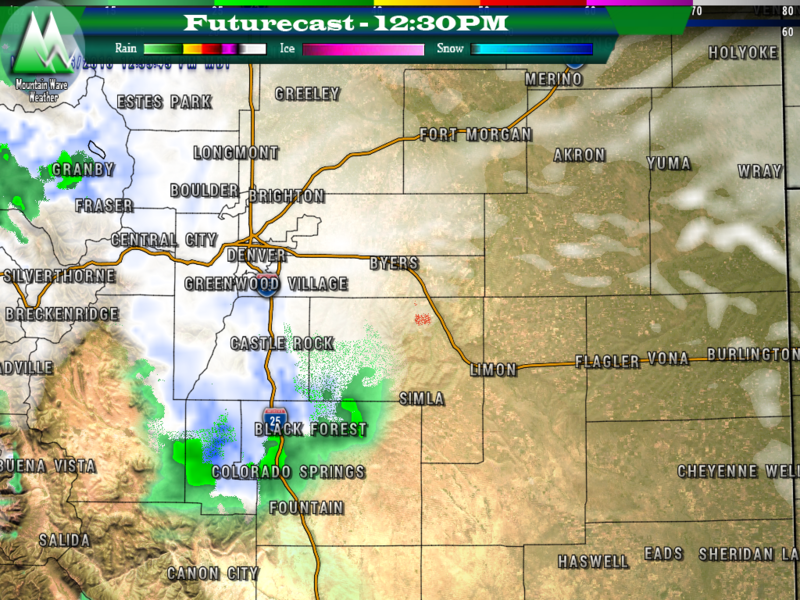 For those of us along the Palmer Divide (a bit closer to home) we can expect the front to move through very shortly. Temperatures were already dropping and winds were picking up at the writing of this article. We expect upslope flow to kick in along with this front and bring the area some snowfall. Temperatures in the middle and lower atmosphere should be cool enough to support snow. The snapshot above from the HRRR model shows a good bit of snow moving through early this afternoon from North to South. Don’t expect a ton of snow accumulation from this system, while it’s not moisture starved it simply moves through too quickly to accumulate much snow. The temperatures this afternoon and tonight will be cooler than we’ve seen for awhile. The snapshot above shows forecast temperatures around 3:30PM this afternoon. Expect those to continue to fall into the evening and overnight hours with many areas ending up in the upper teens and low 20’s for nighttime lows. Not going to dwell too much on snowfall with this storm… models do show some areas getting a bit of accumulation but I think the ground is warm enough where some of these numbers are a bit overdone. The main jist here is many areas along the Palmer Divide will end up with little to no accumulation; areas that do see snow stick could see an inch or two of accumulation. Areas Southwards towards the Springs (think Monument, Palmer Lake, Black Forest) will see very minimal accumulation and strong winds from time to time. Like many of the Northwesterly storms we’ve seen this year, the big winners with snowfall will be the mountains and foothills adjacent to the front range. 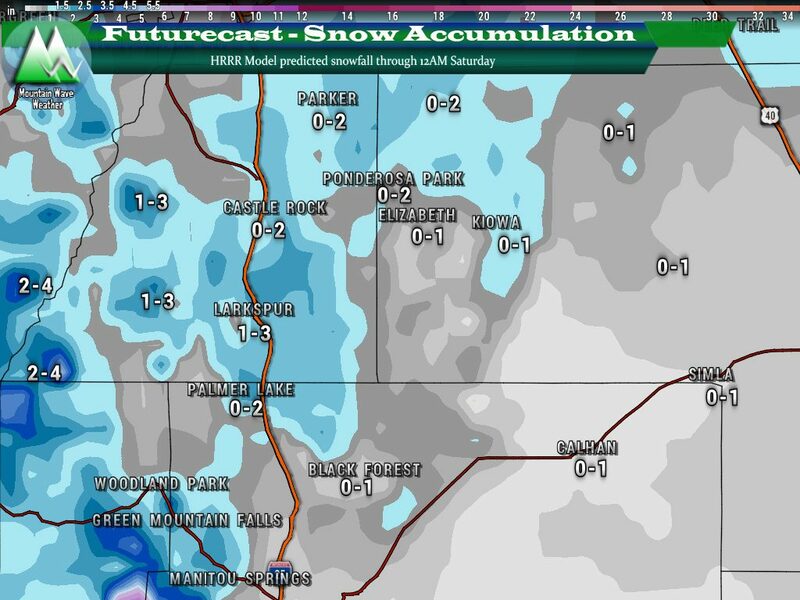 Areas West of Manitou Springs could see 4-8 inches with locally higher amounts in some areas. All in all, we will be glad to get a bit of moisture out of this storm but we don’t see a lot of snow and not a huge impact with this storm system. The main thing to remember is how cold it will be Friday afternoon and into the evening and nighttime hours. If you have plans, be sure to bundle up… it will feel more like January this evening than April. It could be worse, you could be hanging out in North Dakota tonight!